The Wolfpack has played the Thundering Herd just three times, all in the early 90s and all three games at home. All three games were also fairly close. 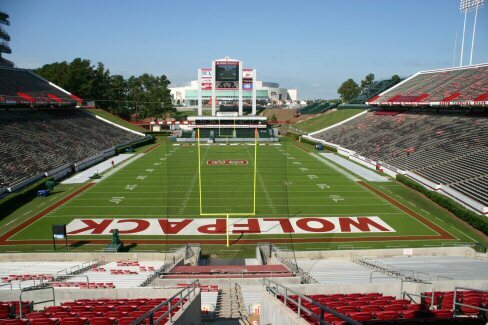 In 1991, the Wolfpack had to score twice in the final 60 seconds of the game to pull out a 15-14 victory and run its record to 7-0. State trailed 14-3 with three minutes remaining. After driving down the field for a touchdown, the Pack got the onside kick and had one last shot. On the final drive, quarterback Geoff Bender was off on a 4th-and-long, but an offsides call on Marshall gave them one more play and the offense ended up scoring. In 1993, QB Terry Harvey and NC State had to score twice in the final 10 minutes to come back from a 17-10 deficit, while the defense shut out the Herd in the second half. The Pack would end up winning 24-17. A player to watch is definitely senior Jaylen Samuels. In the season opener, Samuels was right where he’s always been: everywhere. The senior do-it-all dude was in for a career-high 82 snaps while playing in his hometown of Charlotte, and tied the school record for receptions with 15 - the most for a Pack player in 19 years (Torry Holt in 1998). Samuels had just one rush in the contest (9 yards), but as always, lined up everywhere on the field. He now ranks fourth in school history in career receptions, trailing only names like Jerricho Cotchery, Torry Holt and Eddie Goines. He needs just seven more catches to move into third place. A first-team Athlon and Sports Illustrated, second-team AP preseason All-American, and ACSMA first-team All-ACC choice, Pro Football Focus named Samuels the No. 2 most versatile player in college football. He’s on the preseason list for the Hornung Award, which honors just that, and for the Maxwell Award. Rushing: 90 carries for 566 yards for 6.3 ypc and a TD every 5.9 carries from 2015-17. Blocking: Graded out with 73% accuracy on blocking assignments last season. Also, Samuels has now caught a pass in 29 consecutive contests - that’s the seventh-best active streak in the FBS, the fifth-longest streak in school history and the longest since Jerricho Cotchery had a streak of 39 games from 2000-03.